What does the OpenGL "lost connection" message mean? The NVIDIA OpenGL driver lost connection with the display driver due to exceeding the Windows Time-Out limit and is unable to continue. 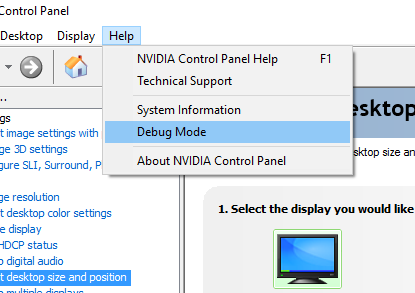 If your graphics card is a factory overclocked graphics card, enable Debug Mode from the NVIDIA Control Panel by going into Help. If this option is greyed out, it means your card is running at NVIDIA reference clock speeds. For advanced users, you may try increasing the timeout value to allow more time to complete more intensive rendering. Microsoft provides information on how to modify the Windows Registry to achieve this. What NVIDIA Products support OpenGL 3.0/3.1?